Mattison owned a 400 acre estate that he remolded after the Windsor Castle in England. 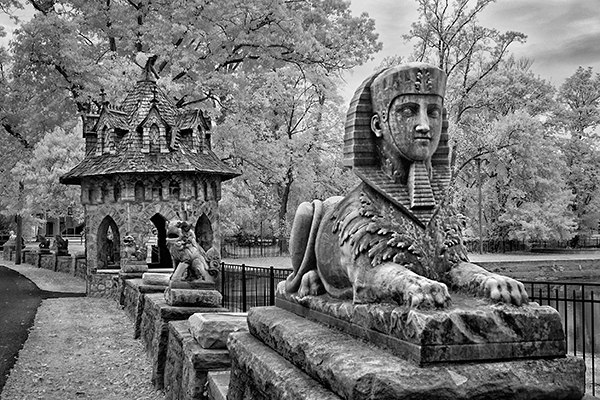 His estate was known as Lindenwold and included a lake, gardens, gatehouses, and elaborate stone walls. Keabey and Mattison’s top executives lived in elaborate stone houses on what was known as Lindenwold Terrace. Mattison was also responsible for building homes for his other employees and still stand today on Mattison Avenue. To honor the memory of his daughter, Esther Victoria, who suddenly died at the age of four, Mattison built Trinity Memorial Episcopal Church. The church was consumed in a tragic fire in 1986, but the congregation promised to restore it. In addition to bringing a new culture to Ambler, Mattison pushed for the incorporation of the town. He introduced street lighting, built Ambler’s first water system, opera house, and participated in town matters. shown is a stone wall with stone statues and the picturesque gazebo located along the lake. I got special permission to enter the property and shoot a few photos.